I recently won a Pocket Operator drum machine at a raffle during the NorthEast Electro-Music Festival and this Teenage Engineering marvel has propelled me towards an exciting new musical direction! Pocket Operators are little Swedish musical devices that look like calculators. After experiencing their fun factor I subsequently bought the PO voice synthesizer so I can emulate the sound of a robot singing my cat's name. 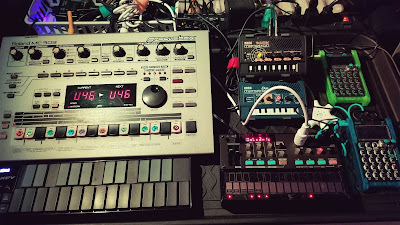 I sync the drums and vocals to a korg volca and use a couple of cheap monotron ribbon synths to apply effects and filters. The brains of the outfit turns out to be an MC-303 groovebox I bought in the late 90s that I stubbornly refused to part with and have recently retr0brighted for the occasion. 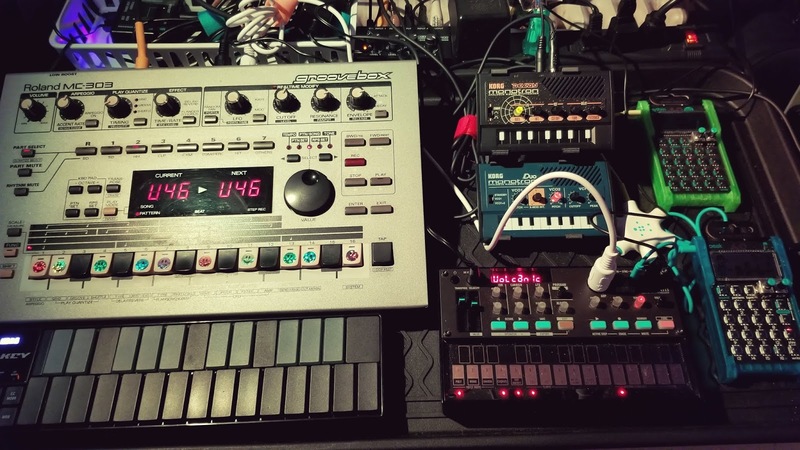 Over the years I had gotten rid of old digital hardware in favor of a DAW (Digital Audio Workstation) and softsynths, so the DAWLESS trend feels "cassettes and command line" retro to me. I prefer producing recorded music on a DAW (I use Reaper) but the process can be 10% inspiration followed by 90% OCD-fueled editing. However performing DAWLESS live sets keeps me in the inspiration part of the creative process and provides the tactile sensation that is sometimes missing when sitting in front of a computer. I enjoy the convenience and versatility of ipad/iphone/android for playing live but plan to perform with the grooveboxes as neon.bev.click on June 29 at Electric Maid in Takoma Park. Hope to see you there!